James Halstead has been in business since 1915. It started out dyeing, finishing, waterproofing and rubberising textiles that were used in rainwear and outdoor clothing. Today it has established itself as a leading manufacturer and distributor of high quality flooring for commercial, contract and domestic markets. Its main commercial brand is its Polyflor vinyl flooring product which is used extensively in buildings such as schools, hospitals, airports, shops, public buildings and factories. It is known for its hard wearing and safety properties. Amongst the company’s other brands is Karndean, an upmarket vinyl flooring tile used in homes. As well as the quality of its products, the company places a strong emphasis on aftersales service quality as a way of giving it a competitive edge. James Halstead is operating in a business where a large chunk of its sales come from refurbishment and repairs. By looking after its customers it is able to secure a significant amount of repeat business and therefore recurring revenues which enhance the value of the company over time. The business has UK manufacturing sites near Manchester and Teesside as well as a large distribution facility near Oldham. Extensive warehousing facilities exist in Germany, Australia and New Zealand. The company has a good track record of investing in its business so that its customers have access to products when they need them. The bulk of the company’s sales come from the UK and Europe. Australasia and Asia are a significant source of additional growth as are countries such as Canada. The presence of UK manufacturing and overseas sales means that the company is subject to significant currency risks both in terms of sales and the cost of imported raw materials. James Halstead does hedge these risks where it can, but changes in exchange rates can still have a sizeable impact on the company’s reported financial results. James Halstead remains a family business. Geoffrey Halstead is the chairman and Mark Halstead is the chief executive. The Halstead family retains a significant ownership stake in the business. Corporate governance looks to be pretty good as well. There are no signs of excessive executive pay or overly generous share options. The company admirably tries to look after its employees by paying 5% of its subsidiaries’ pre-tax profits into a profit share fund each year. 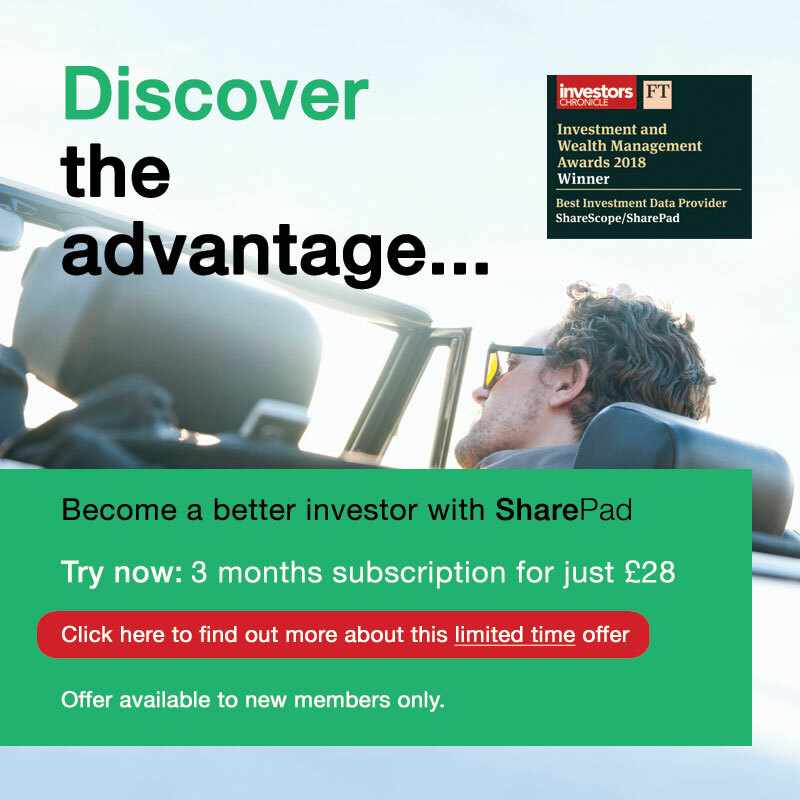 James Halstead shares have proven to be a fantastic long-term investment, but the shares have struggled to make much progress during the last eighteen months. The company has a decent long-term track record of growth. You can see from the chart above that it was able to withstand the 2008-09 recession very well – in fact it continued to grow strongly. One of the first things I look for in any business are signs of recession resilience. 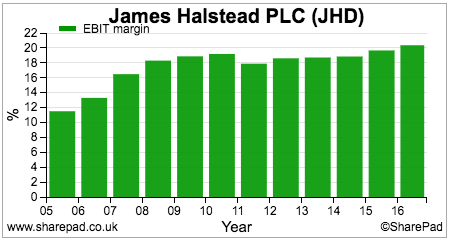 The company’s recession resilience is due to a large chunk of revenues coming from repairs and refurbishments. These can be deferred for a while in order for customers to save money but cannot be put off indefinitely. Vinyl flooring also offers very good value for money and this can lead to customers switching to it when times are tougher. However, since 2012 sales growth has been harder to come by. 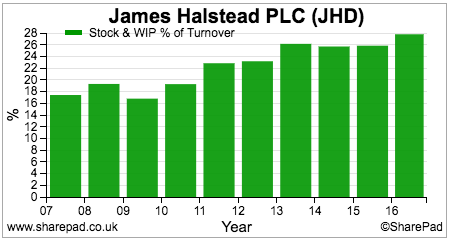 Profits have grown primarily by increasing profit margins. These have come from better cost control, productivity improvements and a richer sales mix – selling more profitable flooring products. James Halstead’s operating margins have been consistently impressive. A business with 20% margins is usually a sign of high quality. The fact that those margins have not been competed away is perhaps a sign that the company has a moat which stops competitors taking a slice of its profits. High margins also protect the investor from temporary profit setbacks in that profits can still fall without becoming losses. Those high profit margins underpin a very high return on capital employed (ROCE) of over 30%. ROCE has been coming down in recent years as the company has stepped up its investment but is still at levels most businesses can only dream of. Cash generation looks to be reasonably good most of the time as well. 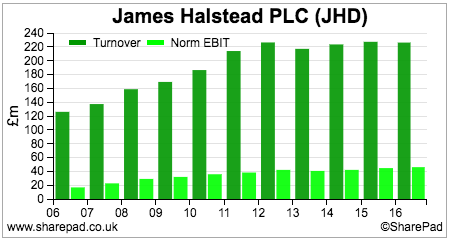 Operating profits (EBIT) mainly convert into operating cash flow. James Halstead does have a reasonable amount of working capital in the form of stock building and making sales on credit (trade debtors) which largely explain why profits don’t always completely convert into trading cash flow. In recent years, the company has also been making top up cash payments into its final salary pension scheme which has reduced operating cash flow. This also explains why earnings per share don’t fully convert into free cash flow per share – along with consistent levels of investment (capex) in the business to support sales growth. I don’t think there’s anything to suggest that there’s any form of profit manipulation going on here. With any manufacturing company it is a good idea to pay close attention to its stock levels. These companies tend to have very high levels of stock (or inventory) in relation to their sales. Stock to turnover ratios of over 20% are quite common as companies build up stock to have an adequate supply of finished goods to sell to customers. 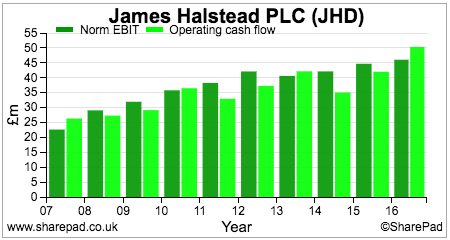 As with many aspects of financial analysis it is often the trend in a ratio rather than its size which is of more interest. A rising stock to sales ratio can be a warning sign to outside investors. Or a build up of stock might mean that there is a slowdown in demand. This could mean that the value of stock needs to be written down in order to sell it which will reduce future profits. James Halstead’s stock to sales ratio increased significantly in 2016. Could this be a sign of trouble ahead? Possibly but there is another plausible explanation. Stock is a balance sheet item which is valued at the balance sheet date. Stock denominated in foreign currencies can increase significantly if there was a sharp fall in the value of exchange rates close to the year end. This is what happened with James Halstead in 2016. It has a June year end and had to value its stock just after the sharp fall in the value of the pound following the EU referendum. 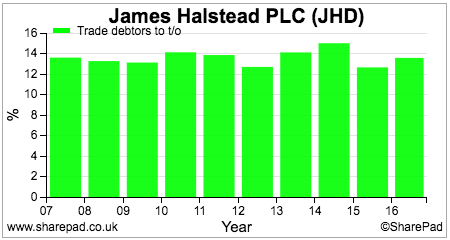 Overseas sales are translated back into pounds at average exchange rates where the effect was more muted. Hence the stock to sales ratio increased. When you are looking at a stock to sales ratio you should also look at the cash flow effect from changes in stock. You can find this information in the notes to a company’s cash flow statement which explain the movements from profits to operating cash flow. 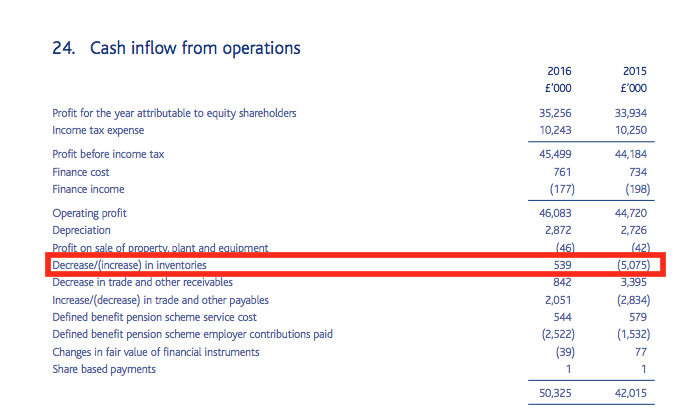 We can see here that James Halstead actually reduced its stock throughout the year and brought in £539,000 of cash flow from it. If the stock to sales ratio had been increasing and there had been a large cash outflow as well then I might be more concerned. That said, it always pays to dig a little bit deeper into the accounts and see if any stock losses or gains have been credited or expensed in the income statement. Above you can see that profits were boosted in 2016 by a stock write back where a previous loss in value had been reversed. In 2015, stock write downs actually reduced profits by £3.8m. 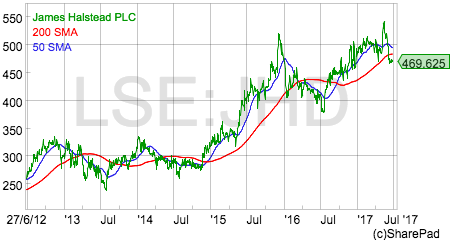 There has therefore been a £5m favourable swing from stock which has boosted profits for James Halstead in 2015. 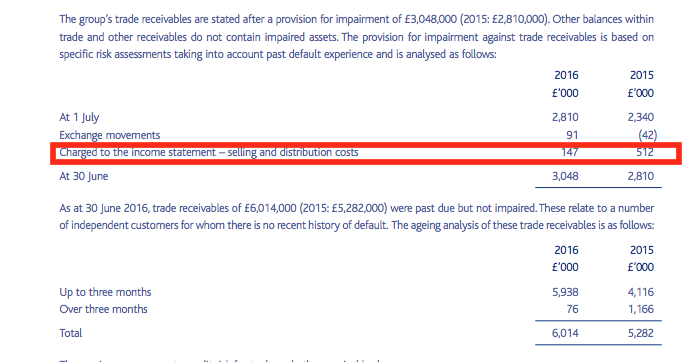 You can do a similar analysis for trade debtors. Customers who buy goods on credit might not pay their bills. These bad debts reduce profits. 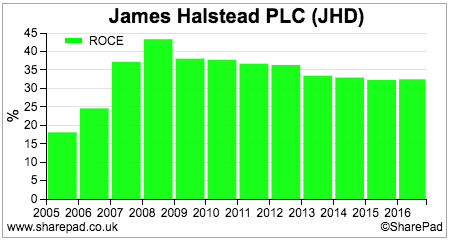 So whilst the Trade debtor to sales ratio is not going up (because the trade debtor figure in the accounts is stated after allowances for bad debts), and cash is not flowing out of the business, bad debts have been reducing profits – By £147,000 in 2016 and £512,000 in 2015. 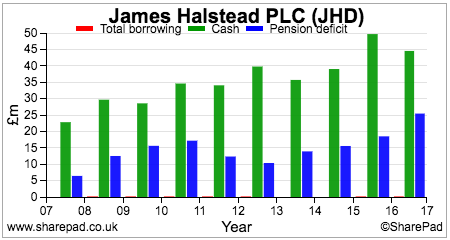 This is in-depth analysis but it can be useful as it can give you some insight into how a company’s profits change from year to year. For example, you can strip out the effects of stock losses and bad debts and look at profits before these are taken into account as I have done below. If there is a stock loss, you add it back to reported profits. If there is a gain you take it away. What we can see in the case of James Halstead is that profits in 2016 received a big boost (a £5m swing as highlighted above) from the stock write back compared to a stock loss the year before. If there had been no gains or losses, profits would have fallen quite sharply. I am not suggesting that there is anything dodgy going on here. A company could be very prudent when valuing its stock – which is a good thing – and find out it has been too cautious a year later. A cynic might argue that this is a good way of shifting profits from one year to another to give the appearance of growth. I’ll leave you to decide for yourselves. 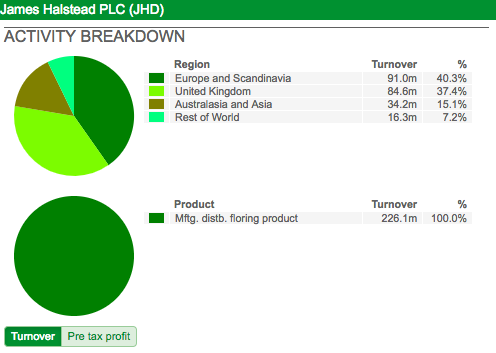 James Halstead has a manageable pension fund deficit, a healthy cash balance and no borrowings. Its financial position is very strong. A quality company but is there enough growth? I like what I see in a lot of James Halstead. It has many of the hallmarks of a very high quality business. This is all well and good but if it is to continue delivering for investors then it needs to be capable of growing its profits in the years ahead. This looks like it is going to be tough – at least in the short term. The interim results released in March showed virtually no growth in profits. 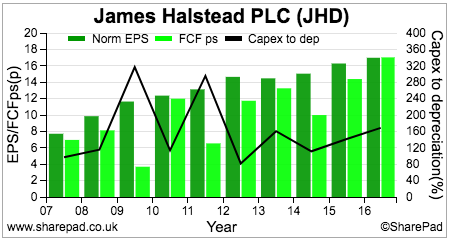 On a trailing twelve month (TTM) basis there was some modest sales growth due to the effect of the lower pound on overseas sales but this also increased the cost of raw materials and reduced profit margins slightly. The concern is that UK sales are struggling to pick up and European sales have also been sluggish. The company mentioned destocking by a major customer in the UK and it remains to be seen whether this effect will reverse during the second half of the year to June 2017. Overseas sales have offset some of the weakness in core European markets due to the weakness of the pound and that is likely to have continued during the second half of the year. However, going forward the benefit from these currency effects will disappear at current exchange rates which will moderate the rate of overseas sales growth expressed in pounds. Forecasting profits in this business is not easy given the level of uncertainty at the moment, but I would not be surprised if analysts’ forecasts were not met given there is not a huge amount of seasonality weighted to second half profits. The muted growth outlook puts the valuation of James Halstead shares into a sharp perspective. At 471p, they trade on a very punchy PE multiple of 26.2 times. Its current profits explain less than half the current share price. This means that future profits have to grow quite strongly and sustainably to get the current valuation to stack up. I’d be quite happy to own shares in this high quality business but perhaps for now it should go on investors’ watch lists rather than into their portfolios.